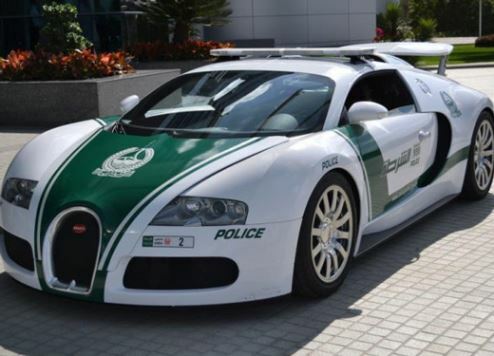 It's official: Dubai Police has the fastest patrol car in the world. The Guinness Book of World Records, the reference book that maintains world records globally, has presented a certificate to Major General Abdullah Khalifa Al Marri, commander in chief of Dubai Police, in recognition of its Bugatti Veyron patrol car. The $1.6 million hypercar, named car of the decade by BBC motoring show Top Gear, has a top speed of 407 km/h and can reach 100 km/h from rest in just 2.5 seconds. The Veyron surpasses the previous record holder set by a US police force, which had a Lamborghini capable of reaching speeds of 360 km/h. Dubai Police is renowned for its luxury fleet, which comprises several performance cars and sports vehicles. They include the McLaren MP4-12C, Lamborghini Aventador, Ferrari FF, Mercedes SLS AMG, Roush Mustang, Bentley Continental GT, Audi R8 V10 Plus, Aston Martin One-77, Nissan GTR and Mercedes SL36 AMG. The BMW M6 Gran Coupe and Mercedes G36 AMG, modified by Brabus, are also part of the supercar police fleet. The cars can be spotted on patrol near the emirate’s leading tourist locations including the Burj Khalifa, the Sheikh Mohammed bin Rashid Boulevard and Jumeirah Beach Residence. The certificate was presented on the sidelines of the 11th International Summit for the Best Police Applications, which was also attended by Major General Abdul Qoddous Abdulraziq Al Obaidly, assistant of the commander in chief for Quality and Exceptionalism Matters, and several senior Dubai Police officers.